If big companies are outed as paying little or no corporate tax, the public outcry is loud and angry. When, in 2014, the EU opened an investigation into Apple and its Irish subsidiary, the public was shocked to find out that the Irish government had issued two tax rulings to help the company save more than €13 billion in corporate tax. The OECD estimates that between 4% and 10% of global corporate tax revenues, or between $100 billon and $240 billion, is lost each year due to tax avoidance. News like this feeds the public opinion that multinational firms (MNEs) do not pay their fair share in taxes. According to a survey by the Pew Research Center (2017), more than 50% of Americans believe that large or multinational companies ought to pay more tax. Profit-shifting. Foreign affiliates enable MNEs to shift profits abroad, out of high-tax jurisdictions. A credible threat to relocate. The operation of foreign subsidiaries signals a higher degree of footlooseness than comparable domestic-only operating firms. This gives MNEs better bargaining opportunities than domestic firms when they negotiate with national government. Size mattering. The larger economic size of MNEs relative to domestic firms increases that bargaining power. All three aspects could lead to much smaller tax rates on corporate profits for MNEs than for comparable domestic firms. To illustrate the difference in tax rates between MNEs and firms without foreign affiliates, Figure 1 shows the average effective tax rate (ETR), for firm types in France between 2007 and 2012. The ETR is actual tax payments relative to pre-tax profits. Domestic firms are separated into single-entity (parent-only) and multi-entity (parent-plus-affiliates). 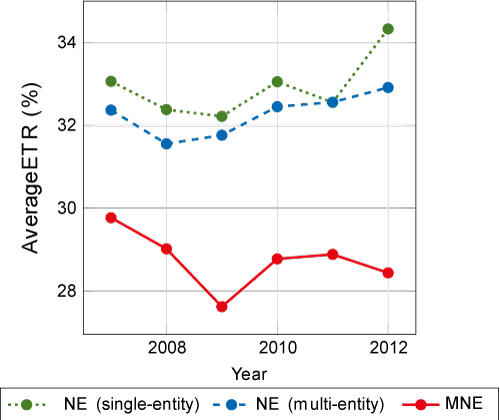 The figure suggests that between 2007 and 2012, on average, MNE tax rates in France were 3.5 percentage points lower than those of multi-entity domestic firms and 4.2 percentage points lower than those of single-entity domestic firms, for the three reasons mentioned above. Well-known profit-shifting channels such as transfer pricing, debt-shifting, or patent-shifting with approximated royalty payments have been identified and addressed by the coordinated actions of international organisations. We focus on a different channel, related to points 2 and 3 above, namely, bargaining between local tax authorities and firms. Firms are able to negotiate deductions with local tax authorities that would reduce their tax burden. Advanced tax rulings are an important tool in this bargaining process. They allow firms to contact tax authorities and discuss deductions if they were to make an investment, and the tax authority issues a binding advanced ruling for the company as part of the bargaining process. Nearly all European countries and the US use these advanced tax rulings. Some countries consider individualised tax breaks and special deductions to be valuable instrument of industrial policy (Economist 2018). But these bargaining opportunities, and the tailor-made tax breaks they imply, undermine the coordinated actions of the EU, the OECD, and the G20 towards establishing a fair system of taxation within and across countries. The Irish Apple case is a well-documented example. In 1991 and 2007, the Irish Revenue Commission issued two rulings that allowed the use of two branches of the same firm to deal with Irish double taxation. This ultimately allowed Apple to shield €100 billion in profits from other tax authorities. Other US multinationals such as Google and Pfizer were not able to use these rulings. The sum is still large. MNEs are, on average, bigger and more profitable than domestic firms. This makes them more valuable for tax authorities and, as in the case with Apple in Ireland, tax authorities are willing to cut better deals with bigger firms. Although the effective tax rate the firm faces is lower, the absolute overall benefit to the country (including revenues from the affected tax bases, such as personal income tax revenues of the firm’s workers) are still large and positive for the tax authorities. Clearly, the tax difference between MNEs and domestic firms flowing from this argument has nothing to do with foreign affiliates per se but only with the size of MNEs. MNEs are more mobile. Hence, threats that they will relocate their activities abroad and away from high taxes are more credible. This greater threat potential relative to domestic firms – even ones of comparable size – may also force tax authorities to make greater concessions. This threat is obviously only relevant for MNEs and cannot be exploited by comparable domestic firms. Empirically, it is hard to disentangle profit-shifting from bargaining as contributors to the tax gap between MNEs and domestic firms. We control for profit-shifting to quantitatively isolate the bargaining aspect of the tax gap, and to disentangle the effect of firm size from the effect of firm footlooseness. We find that MNEs in France have an effective corporate tax rate that is more than 6 percentage points lower than comparable domestic firms after profit-shifting. 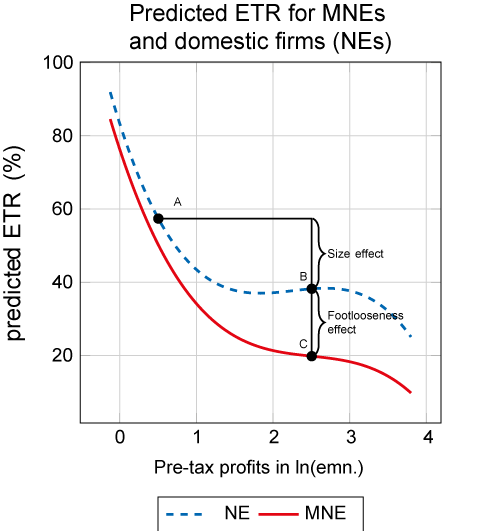 Specifically, the size effect leads to a downward-sloping ETR schedule, meaning that corporate profits for firms with larger pre-tax profits have lower effective tax rates. Figure 2 shows the estimated ETR schedules for French MNEs (the red line) and French domestic firms (blue line). Source: Orbis database and authors' own calculations. Obviously, corporate profit taxes in France decline with the size of overall profits. This is the case for both MNEs and domestic firms, pointing to a regressive size effect that is independent of the firm type. It is bigger for MNEs because they are, on average, larger than domestic firms. The vertical distance between the two ETR schedules for MNEs and domestic firms indicates the tax savings due to the greater mobility of MNEs, given identical pre-tax profits to domestic firms. Both domestic firms and MNEs appear to bargain lower corporate tax rates with the French authorities when they are larger (have higher pre-tax profits), but MNEs are comparably more successful than domestic firms in doing so due to a more credible threat to relocate. Egger, P H, N M Strecker, and B Zoller-Rydzek (2018), “Estimating Bargaining-related Tax Advantages of Multinational Firms”, CEPR Discussion Paper 13143. Egger, P H, R Riezmann, and B Zoller-Rydzek (2018), “Multi-Unit Firms and Their Scope and Location Decision”, mimeo. Pew Research Center (2017), "Summer 2017 Political Landscape Re-Interview Survey – Final Topline", 15-21 August. The Economist (2018), “African governments let too many taxpayers off the hook”, 18 August. This back-of-the-envelope calculation is based on the empirical findings in Egger et al. (2018). It does not consider non-linear effects and disregards the biggest MNEs in France.